If you’re at all aware of Byron Bay and its penchant for outdoor adventure activities then it won’t surprise you to know there are masses of sports shops in the area. For at least thirty years now the area has been renowned as a surfer haven, thanks to its very accommodating currents. Then there’s the treking routes which seem to be everywhere you look. You can’t but pause before spotting a signpost to some walking trail – be it coastal or more bushwalk related. Fancy a spot of skydiving? Then Byron Bay is your spot too. Diving? Kayaking? Yes – it’s all right here. In this post we’ve listed some of the more adventurous Byron Bay sports and activities you can take part in when you come and holiday here. We’ve tried out a few ourselves and yes, they certainly do get the pulse racing! Byron Bay is famous for surfing world-wide. Favourite surf beaches in the area include The Wreck, Main Beach, Clarke’s Beach, The Pass, Watego’s Beach and Little Watego’s. 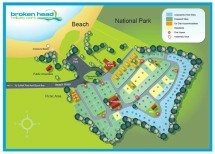 If you’re a surfer looking for somewhere to pitch your tent then then check out our Byron Bay camping ground. If you’re a beginner then there are plenty of surfing schools to help you get acquainted with the sport such as Byron Bay Surf School, Mojosurf, BlackDog Surfing and Soul Surf School. Kayaking in itself is an exhilarating activity but what makes it a knockout adventure and one of the more popular Byron Bay sports is the opportunity you have to come face-to-fin with an array of sea creatures such as the friendly Bottlenose dolphin and large loggerhead turtles. Those lucky enough – and if they’re out at the right time of year – may even glimpse an impressive Humpback Whale or two. For a first-class adrenalin rush it’s difficult to beat a flight over Cape Bryron Nature Reserve or gliding over the Ocean at Lennox Head in a hang glider. For those who’ve never tried this most exciting of Byron Bay sports there are plenty of tandem flights available with experienced instructors and where you’ll be snugly fastened into a harness while soaring into the heavens of Byron Bay. Find out for yourself what an unforgettable birds-eye view of the region is like. Hang gliding isn’t for everyone and that’s why hot air ballooning in Byron Bay is a popular alternative. And we can see why. Flights begin early in the morning to allow passengers to catch the magic of a magnificent sun rise. Viewing the ‘green cauldron’ from above and spotting Mount Warning from the corner of your eye on a level with this Aborginal talisman certainly takes some beating. For the romantically inclined private flights for just the two of you are regularly available. Byron Bay has always attracted more than its fair share of diving enthusiasts. Why? Well, we’re guessing the stunning Julian Rocks Marine Reserve almost certainly has something to do with it. In fact, it’s regarded as one of the top 10 outdoor diving sites in the whole of Australia: quite an accolade we’re sure you’ll agree. At Julian Rocks you’ll spot manta rays, sea turtles and a fantastically diverse range of more than 400 different and incredibly colourful fish. Dive or stay closer to shore on a snorkeling trip. Stay earthbound and see the beauty of coastal waters while motoring through some of Byron Bay’s best-loved towns and villages in the new Spyder Roadster. This three-wheeler motorbike is equipped with a fancy lounge chair for a passenger so you don’t even have to life a finger while you’ll still get that great feeling of the wind whipping through your hair. If you’re an adrenalin junkie then we’ve no doubts that you’ll have been tempted by at least one of the Byron Bay sports activities mentioned above. Even if you’ve tried them before, getting your heart rate going and your stomach flipping over with excitement is still a great way to spend a holiday in one of Australia’s most popular resorts. And while you’re here why not stay at our Byron Bay caravan park where you’ll find plenty of affordable beachside accommodation to hang out in.